The Razer Blade laptop has been graced with a refresh, getting some impressive upgrades in the form of an optional 4K display and Kaby Lake processor. The CPU has been juiced up from Skylake (Core i7-6700HQ) to a Kaby Lake Core i7-7700HQ quad-core processor, the obvious step up to take, providing more grunt and better power efficiency chops. The 14-inch notebook can also now be specified with a 3840 x 2160 (4K) resolution screen, or you can still plump for a Full HD display if you prefer. The other aspect to have been upgraded is the memory, with slightly faster system RAM on offer – you can now benefit from 16GB of DDR4 running at 2400MHz (as opposed to 2133MHz on the previous model). That’s backed, as with the predecessor laptop, by a GeForce GTX 1060 (6GB GDDR5 VRAM), and storage options running from 256GB through 512GB to 1TB (in the form of a PCIe M.2 SSD). And for connectivity, you get Killer Wireless-AC 1535 (802.11ac Wi-Fi) and a Thunderbolt 3 port alongside a trio of USB 3.0 connectors. 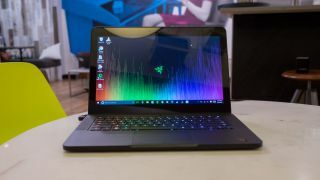 Razer has also equipped this notebook with an anti-ghosting keyboard featuring Chroma lighting effects (customizable to the tune of 16.8 million colors), a 2-megapixel webcam, stereo speakers and Dolby Digital Plus Home Theater Edition sound. Oh, and the weight has been trimmed a fraction to 1.86kg (from 1.88kg), although that’s for the Full HD model – with a 4K screen, the portable is marginally heftier at 1.95kg. The notebook remains 17.9mm in terms of thickness. The new Blade is now available on Razerzone.com (for the US and UK, as well as Canada, France and Germany), with prices starting at $1,899 (around AU$2,475) or £1,799 in the UK – it’ll roll out worldwide in March. However, the 4K screen-toting model won’t emerge until the second quarter; in other words, the earliest we’ll see that is April.